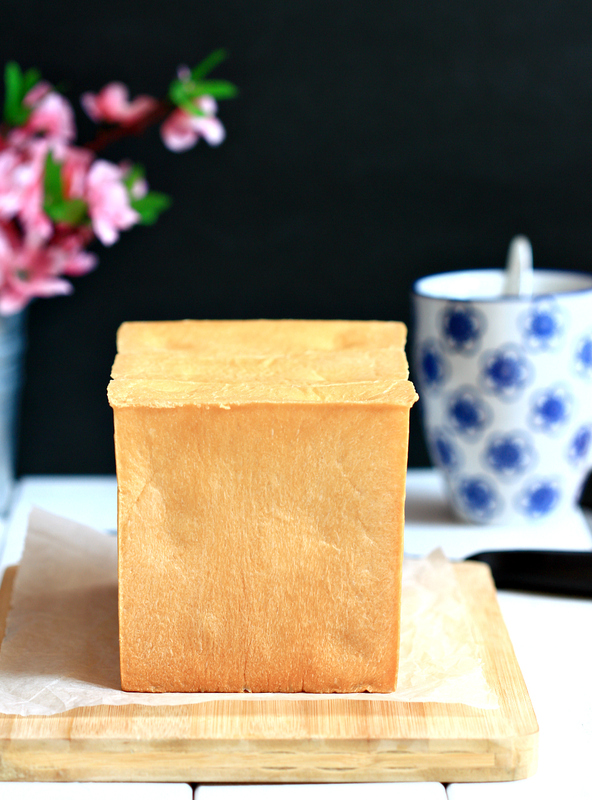 my bare cupboard: 2 cheese Hokkaido milk bread "
I finally caved in and bought a bread machine . Nope , I'm not crazy enough to buy a new one ! Summer is fast approaching and kneading a pound of dough in a small kitchen is not my cup of tea anymore . Hey , I'm getting older ! A bread machine is a great help and cheaper alternative to standmixer if you like making bread . Not only it can knead 1 kilogram of dough , without breaking a sweat , it can also do the first proofing , too ! No , I won't use it for baking bread . Okay , bread machine can't whip cream or do a meringue but where can I buy a HK $ 400. sturdy standmixer ?! That's the price of the second-hand but barely-used Philips bread machine that I bought last month . Not a bad deal , right ?! Anyway , I made another batch of Hokkaido milk toast , I botched my first 3 attempts in the last 2 weeks gahhhhh ! I used an aluminium ( see bottom photos ) pullman tin , some of the cheese leaked out from the side and when I unmoulded it the first time , I got a bald spot in the middle . Same as the 2nd and 3rd attempt *sigh* This time , I used a non-stick pullman tin and as they say , 4th time's a charm hee hee ! The texture of the dough is a bit wet compare to some bread loaf recipes out there , if you want to try it but don't have a bread machine or standmixer , use elbow grease , just add the liquid gradually to get the right consistency and knead until dough passes a window pane test . *** To make tangzhong , place 25 grams bread flour in a small saucepan , gradually add 125 grams water and stir until mixture is smooth . Cook over medium heat until mixture thickens , 1 minute . Transfer starter in a small bowl and let cool completely before using . 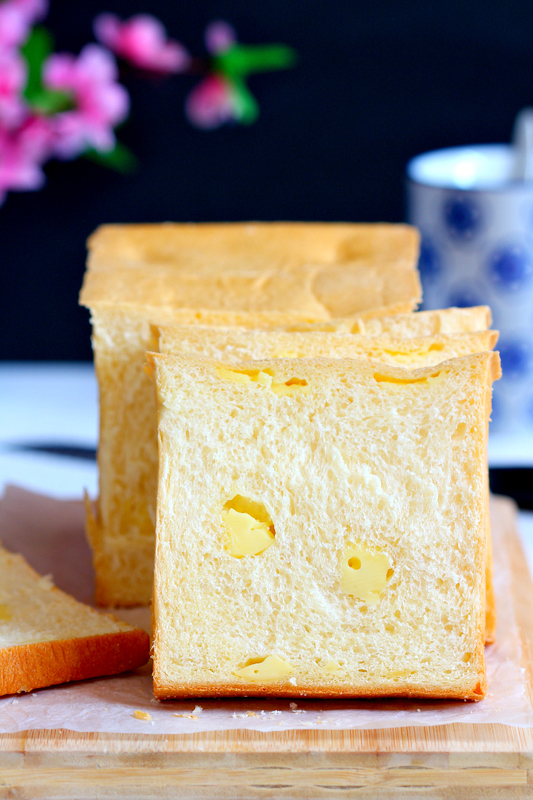 * If using a bread machine , place liquid first - egg , milk and tangzhong followed by salt , milk powder , caster sugar , flour and make a small hole on top of the flour and place the yeast . Select dough program , add butter after 10 minutes and let the machine do the rest . * If you want to exercise your flabby arms , combine the flour , sugar , salt , milk powder and yeast in a mixing bowl , make a well in the center of the dry ingredients and pour in the whisked egg , milk and tangzhong . Knead until it forms a cohesive dough , tip in dough into a clean work surface and knead for 10 or 15 minutes then add in the softened butter . Continue kneading until dough is smooth and elastic and passes a window pane test , about 30 minutes . Transfer dough into a lightly greased bowl , cover with plastic wrap and let rest until tripled in size , about 1 hour , depending on the ambient temperature . * Tip dough into the work surface , knead briefly to get rid of air pockets in the dough . Divide into 3 pieces , form into balls , cover and let rest for 15 minutes . * Lightly grease an 8x4x4-inch non-stick pullman tin . 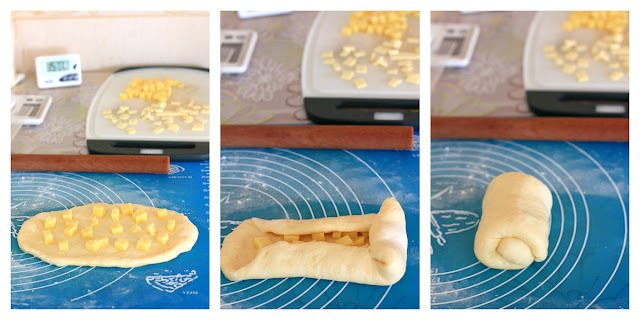 * Roll out one portion of the dough , use a rolling pin to form a rough rectangle , about 8 by 5-inches . 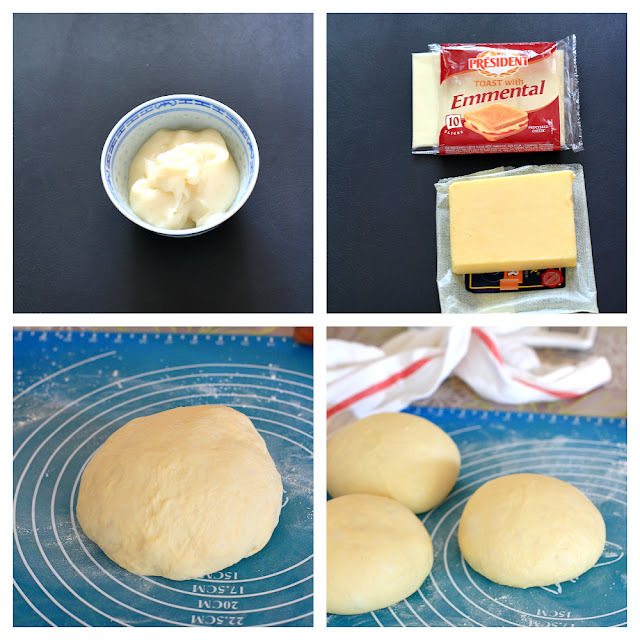 Scatter some cheese on top , on the long side , fold about an inch of the dough in the middle so as the other side to cover some of the cheese , roll from bottom to top and gently seal the edge . Place in the tin and continue with the rest . * Cover tin with plastic wrap or a tea towel , let proof until 90% full ( see photo below ) , about 1 hour and 15 minutes or depending on the ambient temperature . * Meanwhile , preheat oven to 200ºC . 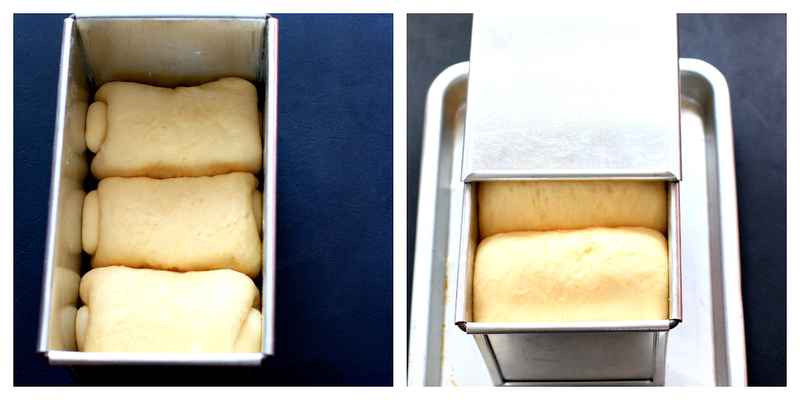 Bake for about 15 minutes at 200ºC then lower to 180ºC and bake for another 20 minutes . * Take out tin from the oven and if using an aluminium tin , gently , really , don't be like me , ran a small knife along the sides of the pan . 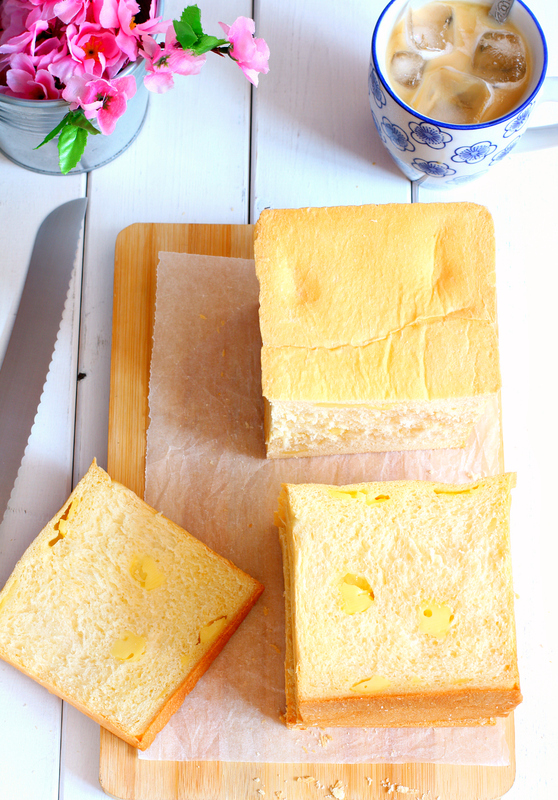 Let bread cool completely . Slice and serve . You such a funny way of writing! Great pictures! I dare not to bake soft bread any more, because I absolutely have no control over them. I just can't stop eating them...terrible me. Your pullman turned out really beautiful, Anne.